Le Club AccorHotels has launched a very interesting promotion for a stay in Asia-Pacific that is both consumed and booked between June 20 – September 10, 2017. Members can earn 2,500, 4,000 or 6,000 points for a stay depending of the Accor brand. Note that this promo appears to be only valid for base level member that has his/her account address in one of the participating countries. You can only earn the bonus ONE time. Certainly interesting promotion from Le Club AccorHotels that I have not seen previously. Seems that they try to get members to stay here that don’t have any previous stays or status. Why penalize and not reward those members that already stay or have status? 1. General Le Club AccorHotels terms and conditions apply to the “Classic Escape” offer and you must be a Le Club AccorHotels member to benefit from it. – earn a bonus of 2500 Rewards points (worth EUR 50) for a stay in one of these participating brands: Ibis, Ibis Styles, All Seasons hotels in Asia Pacific in the Le Club AccorHotels Loyalty program. – earn a bonus of 4000 Rewards points (worth EUR 80) for a stay in one of these participating brands: Grand Mercure, Novotel, Suite Novotel, Mercure, other brands hotels in Asia Pacific in the Le Club AccorHotels Loyalty program. – earn a bonus of 6000 Rewards points (worth EUR 120) for a stay in one of these participating brands: Sofitel, Sofitel So, Sofitel Legend, Pullman, MGallerry by Sofitel hotels in Asia Pacific in the Le Club AccorHotels Loyalty program. These bonus Rewards points are offered in addition to the Rewards points and Status points that are usually earned by the Le Club AccorHotels member for each eligible stay done in application to the Le Club Accorhotels General Conditions of Use. 5. Any consecutive stays (check-out and check-in same day) in the same hotel, will be considered as a single stay. 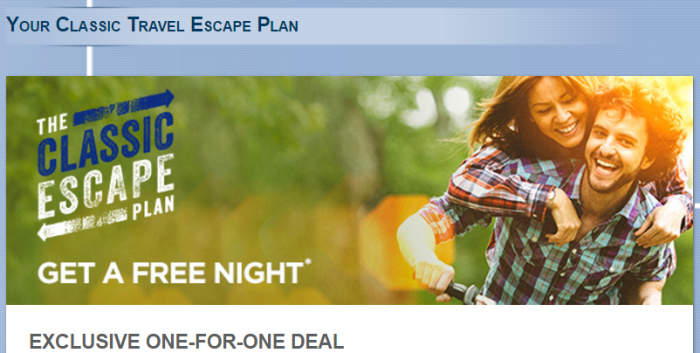 This single stay will be eligible once on the “Classic Escape” offer. 9. Le Club AccorHotels Rewards points are credited to the member’s account within 10 days following the end of his/her stay, and bonus Rewards points will be credited within 20 days from the end of this offer. 13. Please specify the reference 49607 in all your communications with AccorHotels call centers or customers care services related to this offer. 14. This offer can be used only 1 time per member during its validity period. 15. This offer is available only to members with an address in Asia Paciifc. 16. You must register for the “Classic Escape” offer before proceeding to the booking, to be eligible for the offer. 17. This offer is only available to members who received an electronic notification inviting them to take advantage of the offer.